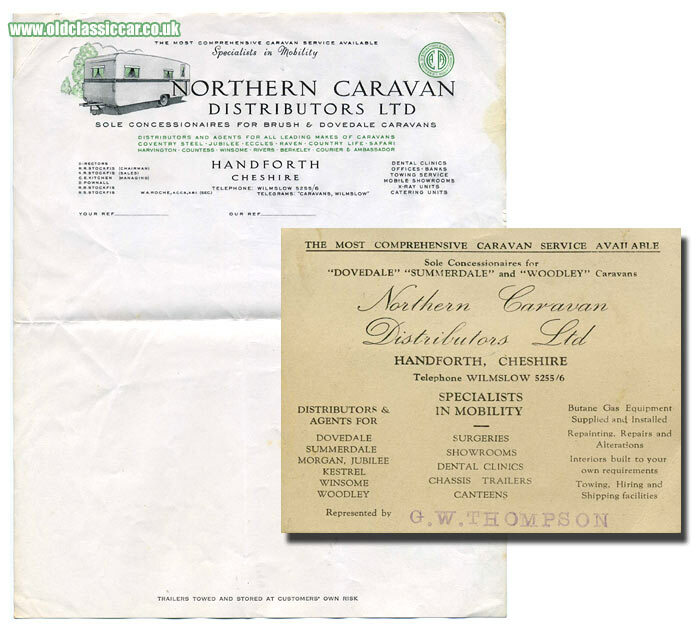 1950's letterhead for Northern Caravan Distributors Ltd, Handforth, Cheshire. Homepage. This page: A letterhead and business card for Northern Caravan Distributors Limited. Prior to the war, my Grandfather flew in the RAF, then worked at Fairey Aviation (Manchester). During the war he served yet again with the RAF, and after it returned to civvy street and a variety of jobs not related to aviation. One of these, in the 1950s, was at Northern Caravan Distributors Ltd, of Handforth, Cheshire (later known as Northern Caravans). How long he worked there for I'm not sure, but the two items shown below were his and are reminders of his time there. In addition to these "classic" caravan names from the past, they also supplied mobile dental clinics, offices, banks, showrooms, x-ray units, catering units and offered a towing service also. It was a large company indeed, and I remember their showroom on the A34 between Heald Green and Handforth well into the 1990s, before the site was sold and re-developed. The Directors were various members of the Stockfis family, along with a D. Pownall and C.E. Kitchen. Telegrams could be sent to "Caravans, Wilmslow". The business card also refers to Summerdale and Morgan caravans, so perhaps it is of slightly different date to the letterhead but again is from the 1950s. Northern Caravans continues to trade in Warrington, so is likely to be the descendant of this firm. For more old caravan items, please visit the classic caravans section.